In a more populous state, this bit of theater might seem meaningless against the onslaught of political advertising and commentary. But such small appearances make a big impact in North Dakota, where retail politics still play an outsize role. This helps explain how Heitkamp, who has run five statewide races before, is breathing down the neck of the Republican candidate, freshman Congressman Rick Berg even though Mitt Romney is expected to handily carry the state. North Dakota is a red state—it’s voted for the Republican in every presidential election since 1968—but its residents are independent-minded. They’ve shown a willingness to split the ballot and send Democrats (especially likable ones), to Washington. The Berg-Heitkamp race is shaping up to be one of the closest Senate contests. As a result, outside money is flooding the state. To date, roughly $5,600,000 has been spent by outside groups on both sides on the race, according to Open Secrets and the Sunlight Foundation—and though that’s less than many of the other competitive races, it is still a lot of money for a state of only 683,932 people. In April, Crossroads GPS, the sister organization to the conservative super PAC American Crossroads, started spending money on the race; they’ve spent $1.1 million, including some on issue advocacy, in North Dakota, so far. The biggest Democratic super PAC contributor, Majority PAC, has funneled roughly $1,048, 221 into the contest, according to Open Secrets. The latest ads on both sides have focused on Medicare—an important issue to likely North Dakota voters, 35 percent of whom are over 55. But the nastiest ones have been ad hominem. Crossroads GPS had to remove a television ad in August that falsely accused Heitkamp of using tax dollars to fly on private planes while she was the state’s attorney general. And Heitkamp ran an ad that Berg has denounced as false linking his work in real estate to privatizing social security. “Rick Berg, treating seniors the same way he treats its tenants,” the ad says. Is it working? North Dakota—home to the “World’s Largest Buffalo” and a place where it’s a running joke that ketchup is too spicy—is an odd state with an odd political climate. The culture in North Dakota is marked by a rugged individualism. Its citizens are populist and egalitarian and skeptical of centralized power, says Dr. Dana Michael Harsell, an assistant professor at the University of North Dakota and co-author of Governing North Dakota. “North Dakotans hold their cards very close to their vest when it comes to voting,” he says. One example of personality trumping ideology was the Senate election in 1986, when Democrat Kent Conrad shocked everyone by coming from 30 points behind to beat Republican incumbent Senator Mark Andrews. The win was possible because North Dakotans had started to question Andrews’ character. “[H]e is deemed to have become a bit unfriendly,” the Economist wrote at the time—explaining that North Dakotans were skeptical of the medical malpractice lawsuit he’d filed on behalf of his wife against a North Dakota hospital and his hiring of private eyes to investigate Democratic Congressman (later Senator), Byron Dorgan. The dynamics may be similar in this race. Berg, one of the richest members of Congress, has come under scrutiny for his business dealings with a real estate company that has been charged with fire safety violations; he voted for the Ryan plan (a hit on Medicare unpopular with North Dakota’s elderly electorate); he’s failed to deliver a vote on the farm bill in Congress; and his approval rating is the lowest among state-wide officials. A poll by the Democratic Garin-Hart-Yang research group at the beginning of the race showed Berg’s approval at 33 percent, as compared with over 60 percent for his colleagues. 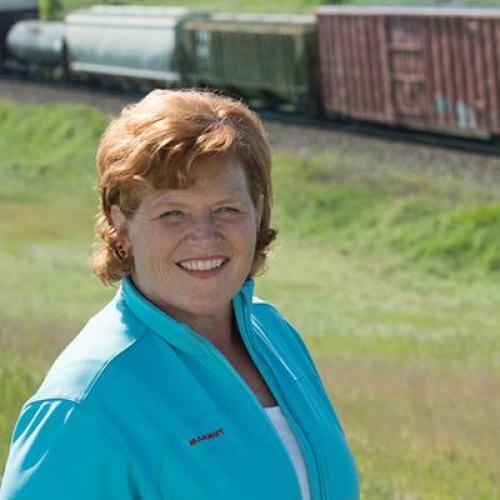 Heitkamp, who is a moderate (she is friendly with the oil and gas industry), is just plain more likable. That doesn’t mean that money spent on advertising wont matter at all in North Dakota. The Democratic Senatorial Campaign Committee—which circulated an internal memo calling the race a toss up the day Heitkamp entered because they knew she was a particularly strong candidate—has kept pace in the race with its Republican counterpart. They’re hoping Heitkamp’s charisma will give her an edge. Still, Republicans maintain a slight lead of about 5 points, according to Real Clear Politics, and they are confident that their money will pay off. Nate Hodson of American Crossroads, says “If we didn’t think it was value added, we wouldn’t do it.” To really find out, we’ll have to wait for the results.